The Coastal Environmental Modelling Team at CSIRO Marine and Atmospheric Research, in Hobart, Tasmania, Australia, has been modelling hydrodynamic conditions within the estuarine environment of south-eastern Tasmania for sev- eral years. Historical model output has been analysed in an effort to identify prototype hydrodynamic states (i.e., frequently encountered typical hydrodynamic situations) exhibited by the estuarine environment over that period. 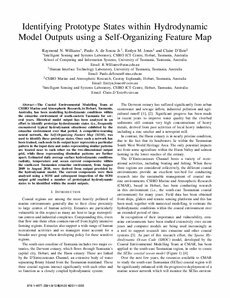 A competitive-learning neural network, the Self-Organizing Feature Map (SOM), was used to identify these prototype states. Once such a network has been trained, each node in its output layer represents a particular pattern in the input data and nodes representing similar patterns are located near to each other on the two-dimensional output grid, while those representing dissimilar patterns are further apart. Estimated daily average surface hydrodynamic conditions (salinity, temperature and ocean current components) within the south-east Tasmanian estuarine environment, from August 2009 to August 2010, were derived from output provided by the hydrodynamic model. The current components were then analysed using a SOM and subsequent inspection of the SOM output grid enabled a number of prototypical hydrodynamic states to be identified within the model outputs.